Hey, fam. On 4/20, I will be in a group show brought to this wonderful world by the LA Street Art Gallery and street artist, sel10ut. 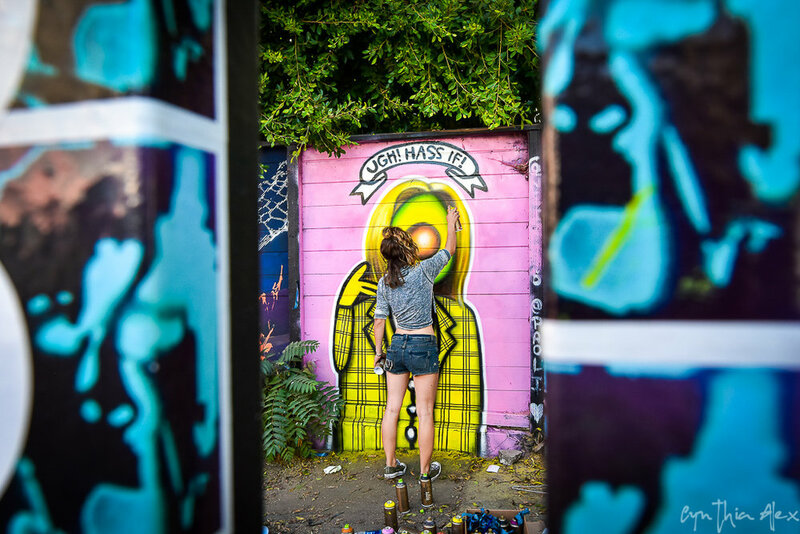 If you’d like to come out for a dope night of curated street art works, you can RSVP here! In celebration of Guactober, I dressed up one of my avocados as Cher from Clueless, and put her to spray on Melrose. You can find her across from the Melrose Trading Post on the corner of Melrose & Ogden in the Fame Yard next to SportieLA! Today I participated in an art benefit for Marley's Mutts at the Dog Bakery in Venice, California, with Wikid Canvas & Arix Art. For anyone who donated, the three of us made custom dog bandanas for their special puppers! As artists, Venice has given a lot to all three of us... This is the beginning of that heartfelt 'thank you’. For anyone interested in parenting any of the (adoptable!) dogs seen in this beautiful video made by Wikid Canvas, head over to Marley’s Mutts’ website to learn more! Hi, friends. 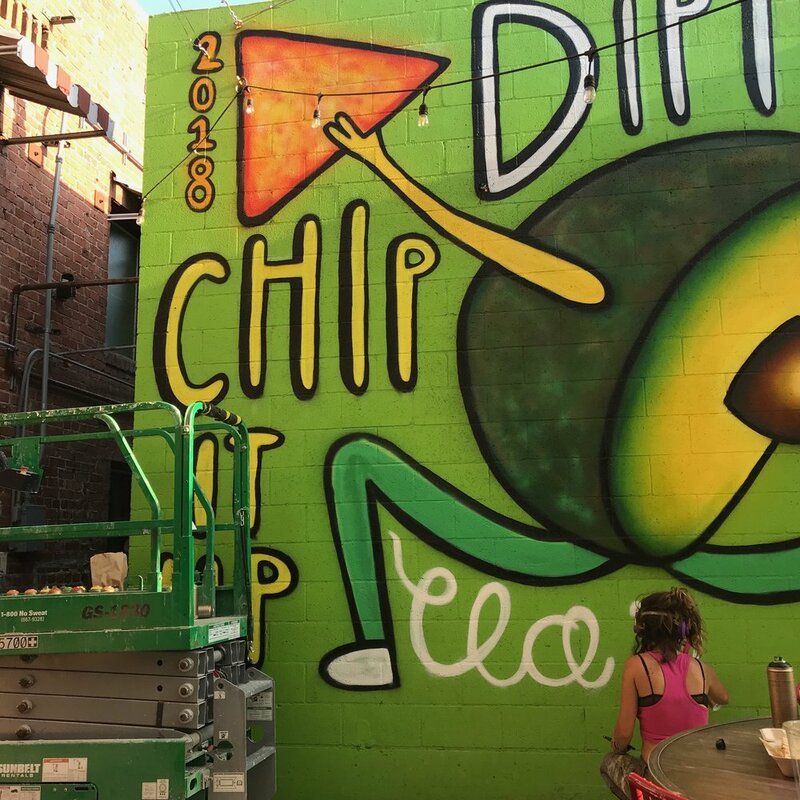 My new mural, "Dip It Low, Chip It Up Slow", inspired by Christina Milian's fresh song Dip It Low is up for your viewing pleasure over at With Love Market & Cafe. Here's some progress shots of that piece in various stages! Yesterday, my story was included as a feature in a series by Voyage LA Magazine titled "LA's Most Inspiring Stories". You can find my article cataloged with stories from DTLA, where I represent my cute and precious hood of Atwater Village. Thank you so much to Sid, and the rest of the team at Voyage LA for this beautiful feature. You are all part of the beautiful, creative momentum keeping this city as vibrant and motivating as I love it be. Link to the article may be found here. Check it out! From November 11th, 2017, through January 12, 2018, my art was on display at Its Raw Poke Shop in Ocean Beach, San Diego. These are some photos from opening and closing night! Thank you from the bottom of my heart to all of the amazing people who came out to meet me, buy some art, chat, take pictures, and help me nearly sell out my first solo show. You are all part of my momentum forever. On November 11th, 2017, I had my first Solo Show in San Diego. This is a review of my artwork by Travis who attended opening night of my show. If you've ever wondered what motivates me to be an artist, this is the answer to that question.